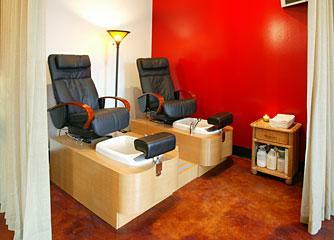 Did you know that we offer manicures and pedicures? Now you can look your best with beautifully groomed nails! Want to wear nail polish, but don’t have time to deal with the chips? Want a polish that can withstand the normal wear and tear of everyday life, like house cleaning and gardening? Now you can! Our new shellac power polish service gives over two weeks of beautiful color, no matter what life brings you, with brilliant durability and shine. Perfect for fingers and toes, the shellac polish system dries your nails instantly, so there’s no danger of wrecking your nails on the way to the car. When you want to change colors, the shellac polish comes off easily with regular nail polish remover. Applied and dried in less than 30 minutes, could this be a new way to spend your lunch break or time while your color is processing? Nail Services at Planet Hair! Show off your nails this spring with a manicure or pedicure from Planet Hair. Our natural nail services will tame even the roughest hide to a soft smoothness you don’t have to cover up. Whether you have a short time or a little more time, we can help you work a little relaxing nail preservation into your day. Choose our express 30-minute pedicure for easy maintenance, or indulge in a peaceful 45 or 60-minute pedicure when you need a little extra TLC. Our pedicure thrones feature state of the art pipeless sanitation system to assure your pedicure is as safe as possible. Appointments are limited, so call us at 316-267-8000 for best available times!